Last year, investors were really bearish on gold, what with the foreseen interest hike that would be imposed by the U.S. Fed. In 2013, economists were sure that gold’s bull run would end in 2014, as the precious yellow metal would most likely be pressured from a stronger greenback and higher interest rates. Those predictions are slowly becoming a reality today. Gold prices have settled at the lowest levels in 8 months during the second week of September, as the dollar continued to gain confidence from investors. Gold lost 2.7% against the dollar and ended in the second week of September with their lowest since December 2013. Gold prices skyrocketed to 70% from 2008 – 2011 when the Fed bought bonds in order to stimulate the U.S. economy. Silver, on the other hand, fared much better than its yellow metal cousin last week. In a report by BullionVault, silver’s prices remained unchanged at $18.56 per ounce last Monday. “The precious metals complex is just completely falling apart, and a lot of it is attributable to the stronger dollar and that interest rates will be higher in the coming months,” said senior market analyst John Payne who works for Chicago-based Daniels Trading. Investors predict the U.S. Fed will set the interests even higher in 2015. In addition, the European Central Bank’s decision to cut interest rates even lower sent the dollar to a 14-month high against other tradable currencies. The U.S. fed is expected to put a complete stop to its stimulus package in October, and raise interest rates in 2015. The turmoil that’s happening in Ukraine won’t be helping gold prices either, as recent data shows that the precious yellow metal’s prices didn’t increase as much as it was predicted to during the peak of the discord in Ukraine. 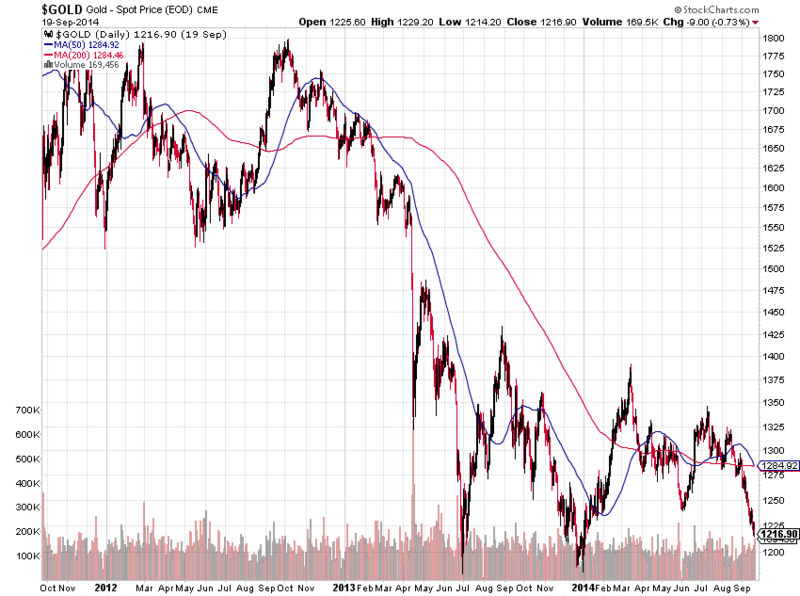 Gold will have to find a better base if it wants to keep its investors happy. How can I get Live Stock Future Quotes in Excel?